The "About" page of Pepper Creek Farm's website opens with "Welcome to the culinary capital of Lawton, OK." While I suspect that statement was meant to be humorous, Pepper Creek Farms takes their commitment to quality very seriously. They even call it an obsession. Stressing the use of fresh, local ingredients, Pepper Creek Farms products are all based on family recipes and made in small batches to ensure the highest quality standards. Pepper Creek Farms offers a wide range of products. On their website, you can purchase anything from gummies to cocktail mixes or jellies. While I enjoy an occasional gummy, I've chosen to stay on topic and focus the review on Pepper Creek Farms' BBQ sauces. Given their geographic location, it's no surprise that Pepper Creek Farms features multiple tomato based BBQ sauces in their product line. The first sauce that I cracked the seal on was their Hickory Maple. The flavor combination of real maple syrup and natural hickory smoke flavor had me drooling before the 14 oz. glass bottle was even open. Pepper Creek Farms' packaging is unique to the BBQ world. The sauce has a "gourmet" flare to it. In the bottle, the sauce is dark red and speckled with spices. Hickory Maple has a medium thickness and pours quickly from the bottle's large mouth. Using ketchup as the base, Pepper Creek Farms accents the sauce with brown sugar, vinegar, dry spices, horse radish, apple cider and (of course) maple syrup. The result is a sweet, robust Kansas City inspired sauce. The smokey finish provided by the natural hickory flavor adds to sauce's depth. There is also "tang" factor that is hard to pinpoint. The overall flavor, though familiar, is superior to the national brand KC style sauces lining the stores of most supermarkets. I heated poured the sauce over smoked chopped pork and pulled beef this weekend. Surprisingly, the sauce complimented both meats equally well. I suspected the sweet sauce would go well with the pork, but it was also delicious with bold, savory beef as well. The medium / thin sauce works well for a variety of applications. It's great poured over pulled meat or used as dip. It's also just thick enough to use as a finishing sauce for ribs and chicken. 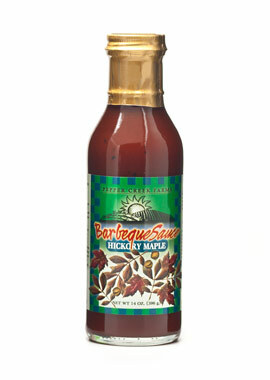 In fact, when paired with a salty, savory rub, I think Hickory Maple would be an excellent rib sauce. Pepper Creek Farms' Hickory Maple BBQ Sauce is the type of product that everyone can enjoy. The flavors are mild enough for kids to gobble up, but sophisticate enough for adult foodies to appreciate. 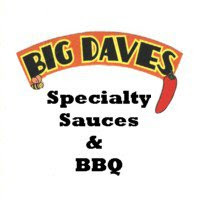 The sweet and smokey flavors of maple syrup and hickory are as good as advertised. 0 Response to "Pepper Creek Farms Hickory Maple BBQ Sauce"